Michelle Obama is going down memory lane. 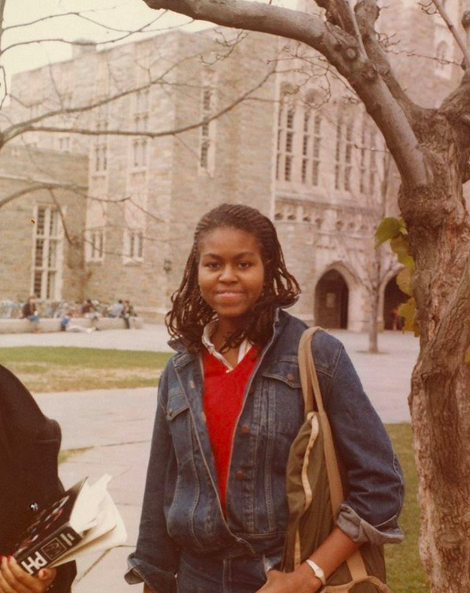 In anticipation of her memoir, Becoming (out Nov. 13), the former First Lady has been sharing photos of her childhood. On Tuesday, she began by sharing rarely-seen photos of herself as a child with her parents in Chicago. She later shared a photo of herself as a teen at Princeton University. Obama ended her caption with some words of encouragement for 2018 grads. Earlier this month, Mrs. Obama hosted her annual College Signing Day celebration in Philadelphia for young people pursuing higher education. The star-studded event at Temple University included appearances by Ciara, Janelle Monae, Zendaya, Kelly Rowland, and more. Obama launched the Reach Higher initiative in 2014 while Barack Obama, the nation’s first Black president, was in office. In addition to giving us all kinds of nostalgic feels, we couldn’t help but notice the beautiful cornrows Obama donned in the throwback picture. It’s hard to make out the exact style she’s wearing, but it does seem to be very similar in kind to Fulani braids — one of our favorite protective styles. While the former First Lady is now known for her bouncy pressed tresses (outside of the one time we spotted her with her natural curls) we love seeing her in a style that we too have worn on so many occasions.